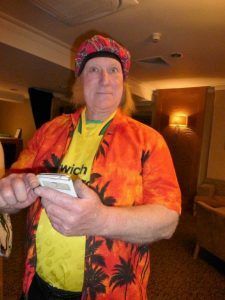 A casino, slap-up meal and a lot of groovy dancing! Posted February 9th, 2019 by Guild & filed under News. 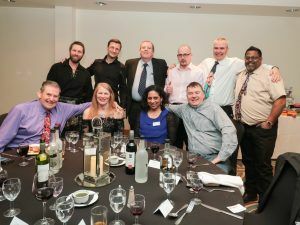 TRY and get plenty of sleep now before the Guild Trade Exhibition 2019 – because the non-stop entertainment at the year’s top event in the chimney industry will definitely blow your brush. 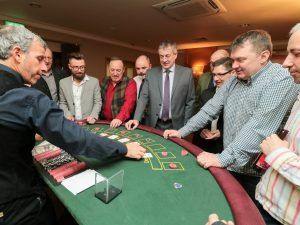 The Guild has organised fantastic activities to enjoy, once you’ve talked enough business, learnt new things at the two seminars, won prizes in the comps and been updated at the AGM – amongst the busy daily activities. The hors d’oeuvres will be the wonderful Gala Dinner – for just £39 (you must book by February 19 and you don’t need to be a Guild member) you can enjoy a superb feast with tongue-tastic options such as smoked mackerel mousse, chicken breasts wrapped in crispy smoked bacon, and Red Berry Eton Mess. See the full menu options by CLICKING HERE where you can also book. The bargain price of £39 also includes a 7-piece events band and our famous charity raffle in aid of CO-Gas Safety – do you fancy winning a quality stove? If you feel your chips are down, and you didn’t win a stove – why not have a go at the popular casino? That’s right, the casino was a big hit at the show last year and they return to entertain us again. Do you feel like a winner…? If you want to organise a dry martini James Bond-style, when you’re taking a turn on the tables, don’t forget to include the authentic ingredients: ‘three measures of Gordon’s, one of vodka, half a measure of Kina Lillet. Shake it very well until it’s ice-cold, then add a large thin slice of lemon-peel. Got it?’ [Casino Royale quote!]. Did we mention a 7-piece band? That’s right. Sweep away your partner or prepare a solo whirl around the dance floor by yourself (or with your sweep mates) courtesy of Grooveology. Grooveology is a proper party band who do superb first class covers of everyone’s favourite disco hits. 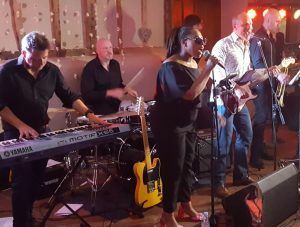 You might recognise the female lead singer Andrea Grant – she has sung in the house band for BBC’s Strictly Come Dancing and worked with Robbie Williams. James Brown and Lisa Stansfield. The other lead vocalist is our very own Iain Stevens, Guild Regional Officer for the South West. Right on Iain. In fact, the band’s musicians have generally worked with an exhaustive list of top acts such as Wet Wet Wet, Toploader, Sir Elton John, Boy George, Gloria Gaynor, Edwin Starr, Tony Hadley, Rosie Gaines, James Taylor Quartet, Go West, The Brand New Heavies, Duran Duran, Rod Stewart, Jools Holland and James Brown. Deadline for booking your dinner is Tuesday 19th Feb. Book Dinner online here. Be prepared. 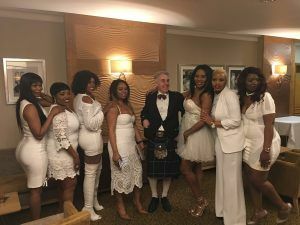 You never quite know what will happen at a Gala Dinner!